1) Put the peppercorns, bay leaf, allspice and cinnamon stick into a large pan and dry roast the spices until they give off their perfume. 2) Add the water, sugar, vinegar and onion and bring to the boil. Stir to dissolve the sugar, then remove from the heat and leave to cool. 3) Peel and trim the carrots and trim the beets. Cut the fennel into wedges. Bring a pot of salted water to the boil and have ready a large bowl of iced water. 4) Cook the vegetables one type at a time, the beets for 15 to 20 minutes, the carrots and fennel for five. As they are cooked, scoop from the water and cool quickly in the iced water. 5) Cut the cucumber into sticks and keep these raw. 6) When the vegetables are cool, transfer to four jars and cover with the pickling liquid. Leave to marinade for 24 hours and eat within three days. 7) To serve, drain off the pickling liquid and serve with the mustard cream and salmon overleaf. 1) Line a dish large enough to take the salmon with cling film. 2) Mix the salt and sugar. Crush the peppercorns and fennel seeds in a pestle and mortar or spice mill and stir into the sugar mix. Cut the stalks from the dill, reserving the fronds for later. 3) Sprinkle half the salt mixture over the cling film, then scatter over half the dill stalks. Put the salmon on top and sprinkle with the remaining salt and dill stalks. Cover the fish tightly with cling film and put in the fridge overnight. 4) The next day, soak the cedar plank in water for two hours. 5) Meanwhile, make the sauce. Combine the mustards, lemon juice and sugar in a bowl with a little salt. Stir in the crème fraiche and dill. Chill until required. 6) Unwrap the salmon, brush off most of the marinade and pat it dry with kitchen paper. 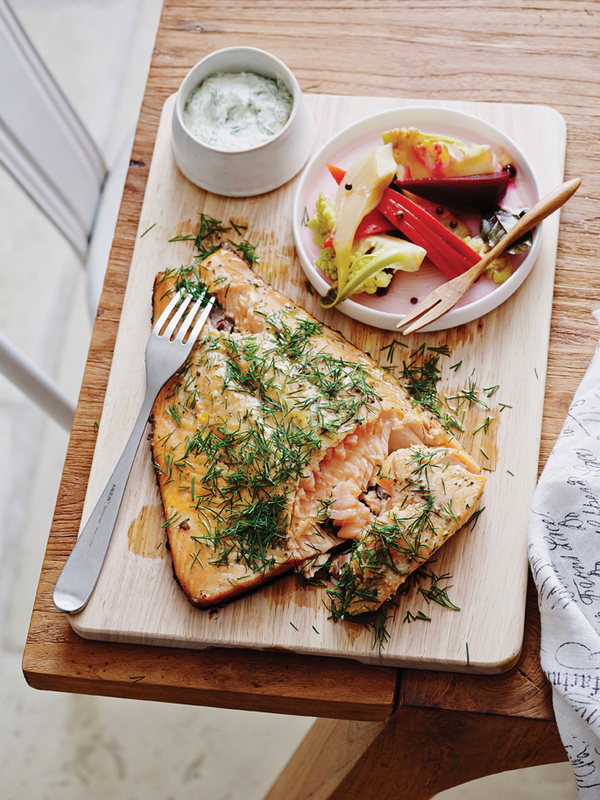 Brush the salmon lightly with oil on all sides and place salmon on the prepared planks, skin side down. 7) Cook the salmon for 12 to 15 minutes, covered with a tent of foil or the barbecue lid. 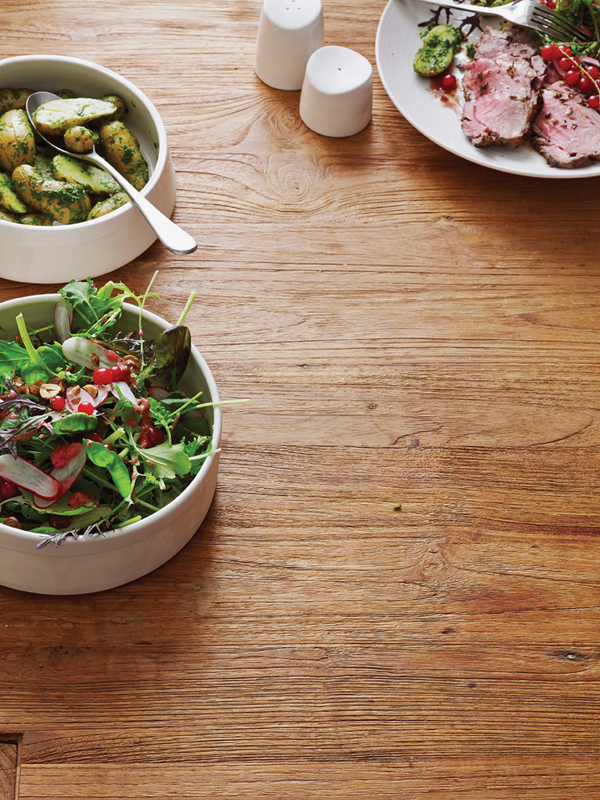 Serve on the board scattered with dill sprigs with a bowl of sauce and some pickled vegetables on the side. 1) Preheat the oven to 200˚C and lightly oil two large baking trays. 2) Make the crispbread dough by sifting the flour, salt and baking powder into a food processor. Stir in the seeds, then add the water and oil and process until the ingredients just come together. 3) Transfer to a lightly floured surface and knead the dough into a ball. Wrap it in cling wrap and chill for 15 minutes. 4) Roll the chilled dough out to a large thin rectangle, about 2mm thick. Cut into long thin triangles, then bake for about 15 minutes, until crisp and lightly golden. Cool on a wire rack. 5) Meanwhile, combine the cheese, buttermilk and oil, season with salt and pepper and until smooth. 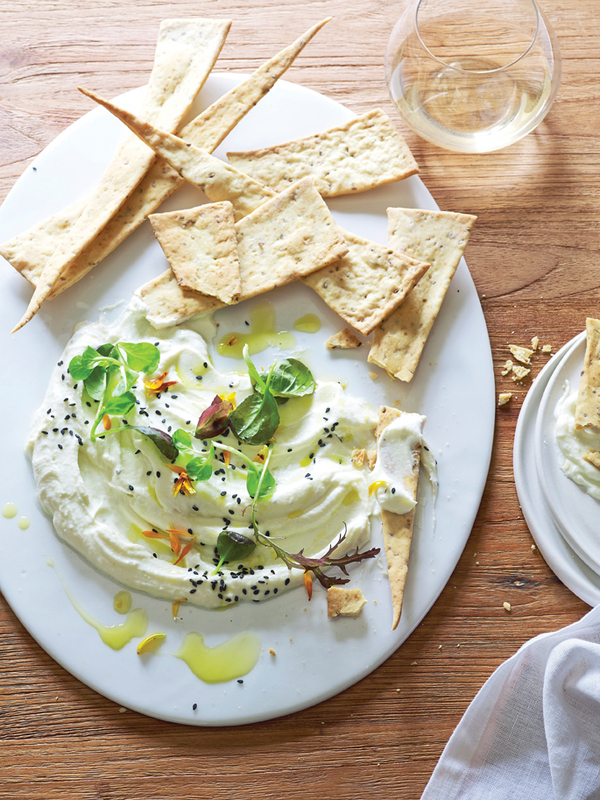 6) Spread the cheese onto a plate, scatter over the the nigella seeds, drizzle with a little oil and serve with the crispbreads. 1) Scrub the potatoes and place in a large saucepan of lightly salted water. Bring to the boil and cook for ten to 12 minutes until tender. 2) Meanwhile, place all the remaining ingredients in a food processor and blend to form a smooth green sauce. 3) Strain the potatoes and return to the pan, add the pesto and stir well until coated. Serve with the lamb. 1) Tip the leaves and radishes into a bowl and mix. 2) Mix the oil, vinegar, mustard and honey together, season with salt and pepper and set aside. 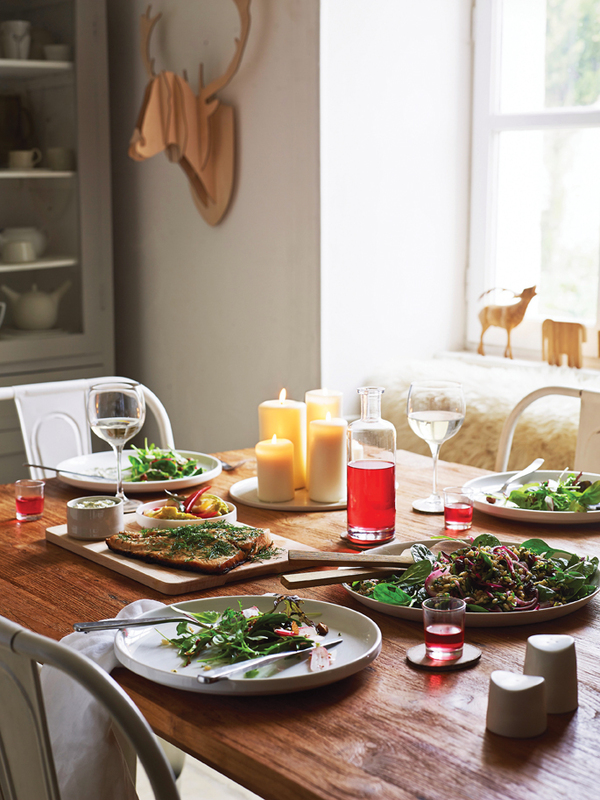 3) To serve, dress the leaves and radishes, top with the hazelnuts and redcurrants and serve with the lamb and potatoes. 1) Combine the rosemary, oregano flowers, crushed fennel and crushed allspice in a bowl and add some pepper. 2) Place the lamb on a board and using a sharp knife score the flesh in a diagonal pattern all over. Brush with oil and rub the herb and spice mixture into the lamb. Cover and leave to infuse overnight. 3) Preheat the oven to 230˚C. 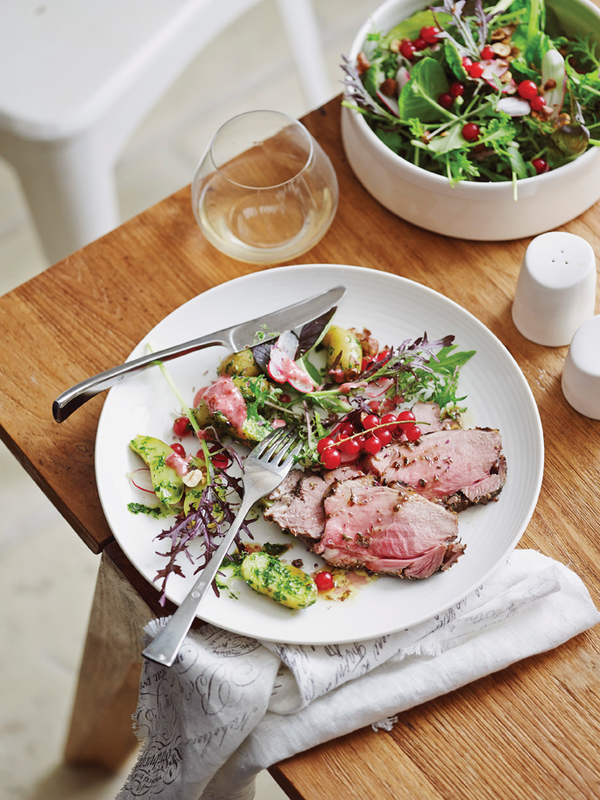 Arrange the lamb on a rack set over a roasting tin with 150ml of cold water in the bottom of the pan. 4) Combine the redcurrant glaze with a little salt and brush all over the top of the lamb. Transfer to the oven, oven and immediately reduce the temperature to 190˚C. Roast for 30 minutes until browned. 5) Remove the lamb to a platter and wrap loosely in foil. Transfer the pan juices to a small pan, reducing slightly if necessary, and keep warm until serving. 1) Cook the wheat in plenty of boiling salted water for ten minutes, or follow the pack timings, then drain well and leave to cool. 2) Peel and thinly slice the onion and mix with the vinegar. 3) Add the cherries and pistachios to the wheat and mix well. Pick the leaves from the mint and snip the chives, then stir in thoroughly. Add salt and pepper, then mix in the oil. 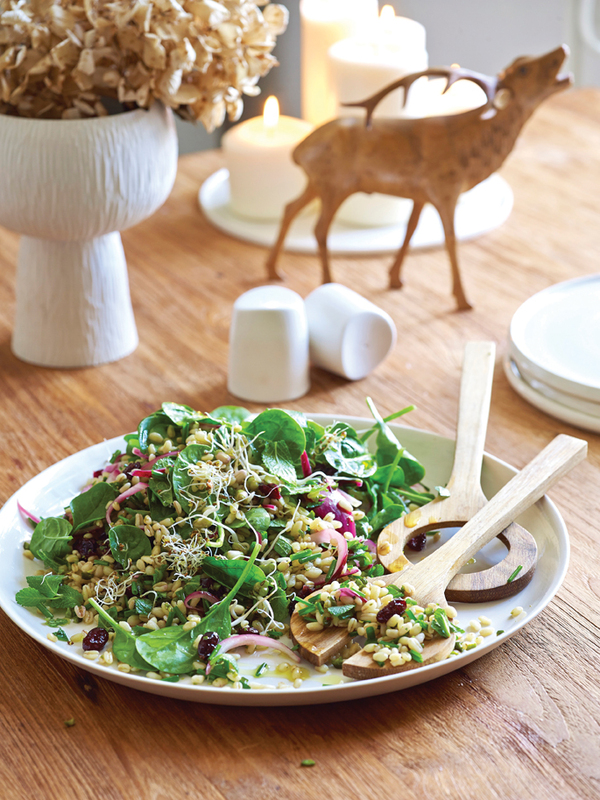 4) Tip onto the wheat and toss everything together until the wheat berries are glistening. Serve on a bed of spinach leaves. 1) Make the topping by cutting the herring into small bite size pieces. Poach the quail eggs in a little gently simmering water for about a minute, until cooked to soft, then remove with a slotted spoon and cool in cold water. Transfer to kitchen towel to dry and set aside. 2) Just before serving, very finely julienne the apple, then toss with the vinegar. 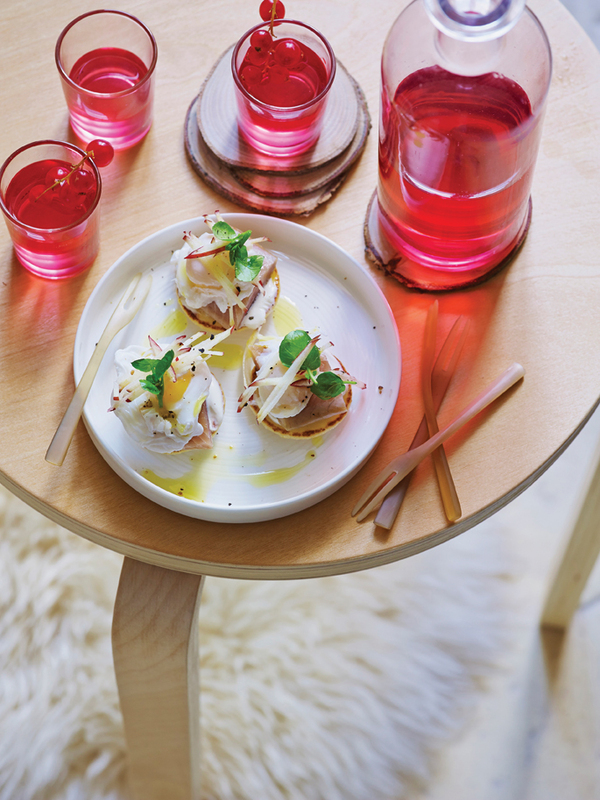 Spread each blini with a little crème fraiche and top each one with a slice of herring, a poached quails egg and a garnish each of the apple and watercress. 3) Season with salt and pepper and serve drizzled with a little oil.